“Vicky ‘Camilla’ Barcelona” – Javier, where are you? Barcelona is colourful, in a terra-cotta kind of way. I arrived early this morning and, like other times when I travel afar, I found myself a bit dazed and confused. Even though my ticket said that I would be arriving early in the day, I found it difficult to discern whether it was – in fact – morning or if it was early evening. The sun cast odd (to me) hues across the concrete-scape of Barcelona metro as the buildings whipped by my taxi window at a dizzying rate. They are deceiving colours, ones that can play time-tricks on the mind. The Hotel Alexandra is lovely and I really wanted to get to my room and crash. But I had to kill a few hours before I could check in. That meant staving off this impending jet-lag which, no doubt, accounted for my disorientation. Jet-lag always makes me feel as if someone has stuffed cotton into my nose and ears, clear up to the grey matter. I headed out on foot with a goal of making it to the Picasso Museum. I made my way down Av. Diagonal towards the older part of Barcelona. High-end stores line this main drag but lucky for me (and my pocketbook) none were open. It was too early. I passed by Casa Batlló, a building restored by the infamous architect Antoni Gaudi, and noticed that the structure was already drawing a crowd outside even at such an early hour. Wow. 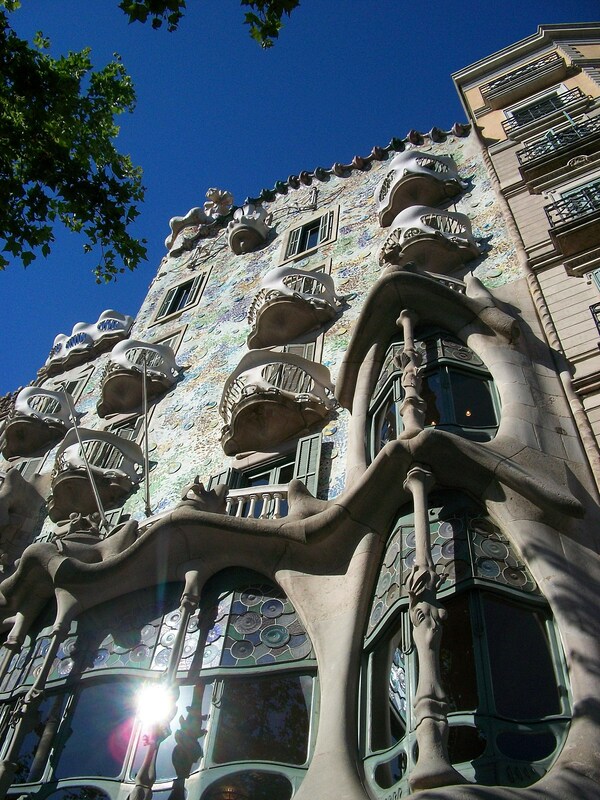 Gaudi’s gift of architectural art is well-known all over the world and his works are certainly sights to behold in Barcelona (Gaudi Park comes highly recommended – I will try to get there this week as well). I spent a bit of time people-watching (and resting my tired hoofies) at the Plaça de Catalunya which is a large square in central Barcelona and near Las Rablas. Then I made my way to Le Seu Cathedral which is in the center of the Barri Gòtic (Gothic district). What a stunning structure! I love Cathedrals. Especially Gothic Cathedrals. When you enter Le Seu, the silence is deafening. It almost feels like you have been cloaked in heavy velvet as you pass through its portal. And I don’t know where I have been for the past several years but it appears that technology has a firm foothold in the Cathedrals. The faithful can now insert coins – as signs of prayer or reflection – and one or more electric candles will temporarily light up. Call me old fashioned, but I still favour a more traditional approach: sulfur, glass powder and oxidizer put to wick and wax. I can’t say enough about the Picasso Museum. It was the highlight of my day. I am not as familiar with the Degas-esque part of Picasso’s career but it was interesting to view the evolution of this artist’s life through his work. From muted tones in the late 19th century, to wild shots of colour coming into his works at the turn of the century (influenced by his time in Paris) and then there was the blue period…all this evolving into the oddly childlike, yet powerful works that most of us probably are most familiar with when one conjures up visions of “Picasso”. By the way, no sign of Javier Bardem. Damn it. ← Celebrating milestones as only the Stampede can! Being the nerd that I am, I look forward to hearing about your presentation and the report. Yay! so glad you made it to the Picasso Museum. It brought me to tears. Enjoy Bara! It’s one of the most beautiful cities in the world. See you in Ravello!